Breeches,Medium, Black - this item is in closeout and has been reduced to sell quickly!! This may sound really strange, but I want breeches to come back into style. Honestly. I mean, look at them. They're probably the most comfortable pants ever made. Baggy for ultimate comfort no matter how much weight you've gained or (as in my case) how large your genitalia is. They stop at the knees so they won't get caught under your heel or get wet when you cross a puddle (or bloodstained when you clean up the mangled corpse in your basement). These velvet breeches are copied from an actual pair of breeches from the Germanisches National Museum in Germany. We've included every detail of those very breeches into these (although we have spared you the caked on layers of dust and the hidden proximity alarm that goes off if you try to take them out of the museum's display case). The Gracidmar Breeches, as alluded to above, are made from fine velvet and are lined in cotton. They feature a stylish button-fly design and pocket bags for you to store your large collection of pockets in. Um actually, my editor just told me that the pocket bags are actually just large pockets and can store anything you want. But if you DID have a large collection of pockets, you could probably put them there. 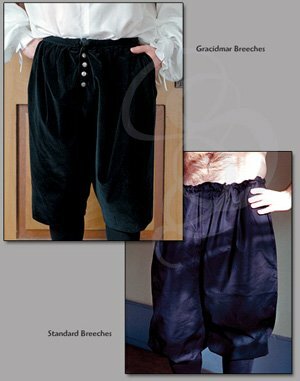 These velvet breeches have a drawstring waistband for a perfect fit and can actually be machine washed (tumble dry).